The M23 rebels have penned an open letter to Obama, asking him to scotch the proposed intervention brigade for eastern Congo. The inquiry into human rights activist Floribert Chebeya's assassination has again been delayed, and the organization he headed, Voix des sans-voix, continues to boycott the proceedings, saying they are a whitewash for the man almost certainly responsible for his death, former police chief John Numbi. Can't possibly be true: South Africa is planning to invest $20 billion in Inga, says DigitalCongo. Seems too high by an order of magnitude. an Antonov AN-12 cargo plane prepares to leave Goma. With about a dozen crashes in the past two years, the DRC remains the most dangerous place to be a plane: Radio Okapi reports on a conference held to address airplane safety. 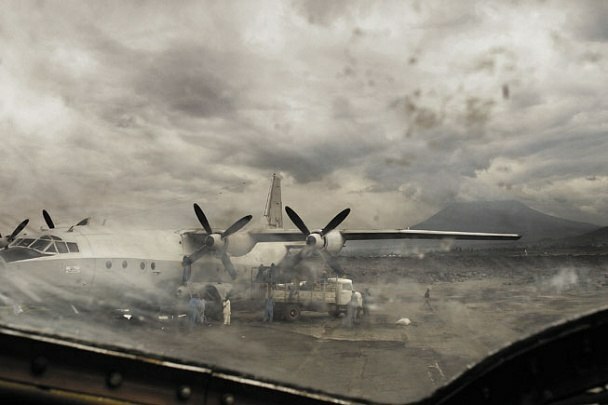 Which reminds me to plug this 2007 piece on Congo's aviators by William Langewiesche. Questions continue to emerge about whether South Africa's recent decisions to participate in peacekeeping operations in CAR and now DRC are driven by the desire of the well-connected elite to protect their investments. More tk on this.